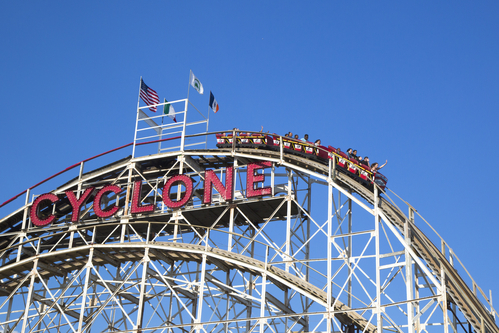 No visit to the Brooklyn area is complete without taking a ride on the Coney Island Cyclone. It’s a survivor from the area’s history as a seaside resort, dating all the way back to 1927. The Coney Island Cyclone has defied time, economic downturn and the prospect of demolition to remain standing; it was closed to the public for six years from 1969 before being rescued by the creation of Astroland Theme Park, which it has now outlived. It needs fear the bulldozer no more; the Cyclone was recognized as a landmark of the city in 1988, and then a National Historic Landmark three years later, protecting it now and forever. There may be newer, taller and faster roller coasters in the USA than the Coney Island Cyclone, but none of them can beat the feeling of riding a piece of history. Its wooden construction means you can feel every rattle and rock as you hurtle across over 2500 feet of track, with twelve separate drops leaving you hanging on to your breath and gripping the bar tightly. At the peak of the thrill, the Cyclone will send you on an 85-foot plunge down a 60-degree incline at sixty miles per hour, at which point you’ll swear it’s the most terrifying rollercoaster you’ve ever experienced! This legendary fairground attraction is better lived than read about and deserves inclusion on any New York visitor’s ‘to-do’ list.